Allegro Medical presents the Lumbar Cushion. Turn the seats in your home, office or car into a more supportive place for your lower back. The DMI Lumbar Support Cushion will help you sit straight and avoid the bad posture and back ache that come from slouching. Simply place the cushion on your chair and attach the convenient elastic strap to hold it in place. 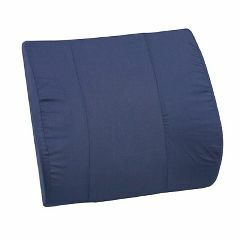 It also makes a great bedrest to use when reading or working on your laptop or tablet while sitting in bed. Attractive Design. Solid Construction. Comfortable. Effective. Easy To Use. by Marti from N. E. PA. Effective. Stabilizes. Comfortable. Easy To Use. This product is great, except that it is not described correctly. That is, the support without the strap is really a cushion to be used in a bucket seat of a car and is shaped differently than the one with a strap. The strap type has a flat backside and is useful in a chair, but useless in the car. I am now faced with returning the product and I will probably get socked with extra charges. Know exactly what you are getting before you buy. This product, while probably a good product, did not really meet my husband's needs. Would probably work well when placed against a flat surface, but if there is any type of curve, I would not recommend this support. Is it good for the couch?